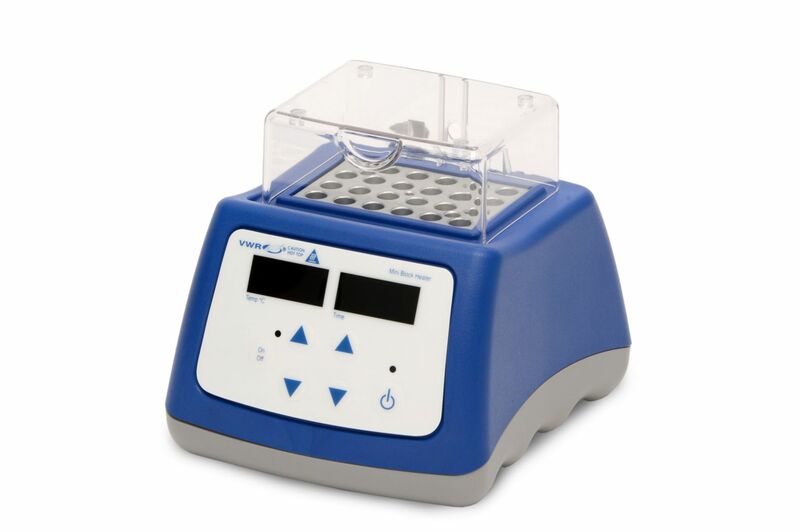 VWR® Advanced Mini Dry Block Heaters and Mini Dry Block Heaters with Heated Lid are ideal for a variety of applications that require accurate and repeatable results such as LAMP assays, immunoassays, enzyme reactions, and denaturations. These personal sized heaters take up minimal bench space and are small enough to fit in the palm of your hand. Block heaters accept one interchangeable mini block for 0.2 mL, 0.5 mL, 1.5 mL, 2 mL, 15 mL, or 50 mL tubes; however, the heated lid model is not designed to accept 15 mL or 50 mL tubes. Both models include a clear polycarbonate lid to help prevent evaporation and maintain temperature uniformity. The cover for the non-heated lid model is easily removable when incubating 15 mL or 50 mL tubes. Efficient heater features close tube and block contact with a low density design for exceptional temperature uniformity. The heated lid model includes a second heater in the lid to help prevent condensation. Units include a block lifting tool. Mini Modular blocks are sold separately. PID temperature control provides temperature accuracy as low as 0.3°C and uniformity as low as 0.2°C. Samples are heated to temperature quickly and accurately. Temperature can be adjusted in 0.1°C increments. 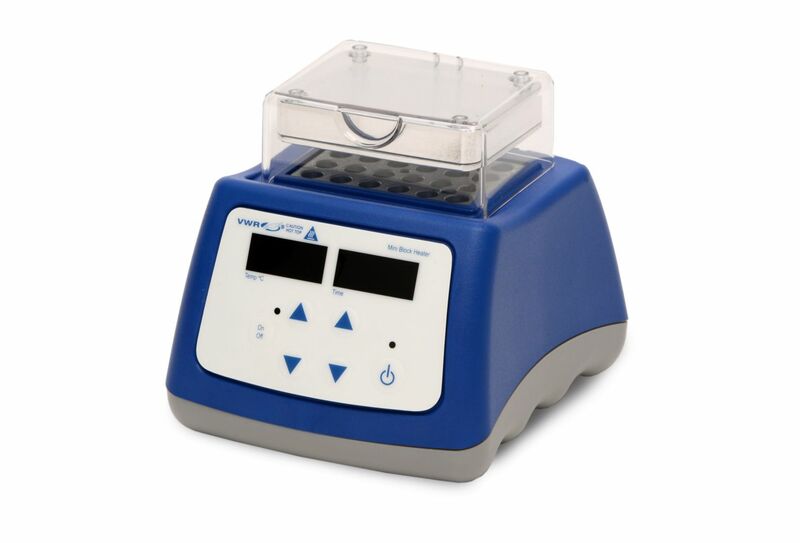 Touch pad controls with easy-to-read, independent LED displays for temperature and time provide repeatable and accurate results every time and are easily visible across lab benches. Timer will display elapsed time, or when programmed to a user defined limit, will shut off when unit reaches zero. Display will show last settings, even after power has been turned off. Temperature calibration mode allows user to calibrate unit to an external temperature device. Cool touch housing is constructed from a high quality, heat and chemical-resistant polymer. The unit’s housing remains cool to the touch throughout normal operating temperatures. In timed mode, an alarm will sound when the timer reaches zero and when the set temperature is reached. The heated lid helps to regulate the temperature and reduce the amount of condensation on sample lids. NOTE: To avoid possible electrical hazard, do not fill well or block opening with water or other fluids. Unit is designed as a dry bath/incubator. Certifications: RoHS certified. TUV listed. Calibrated Dry Block Heaters include a Troemner ISO/IEC Accredited Calibration Certificate traceable to NIST. The ISO/IEC 17025 Accredited Calibration Certificate includes multiple data points within the temperature range and time function with the associated uncertainties. Troemner is accredited by NVLAP under Laboratory Code 105013-0 to perform ISO/IEC 17025 calibrations. Accessories information: Heaters require a VWR® Mini Modular block for operation. Mini Modular blocks are sold separately. Ordering information: Unit must be ordered with heating block(s). Block Heaters with NIST traceable calibration certificate provided by an ISO/IEC 17025 accredited laboratory. Multiple data points within the temperature range and time function are reported on the certificate with the associated uncertainties. All units include a 234 cm (92”) detachable, three-wire cord and plug. Units come with a five-year warranty on parts and labor.